Tokyo has not only the big city, it has also has a beautiful waterfalls at Okutama area. 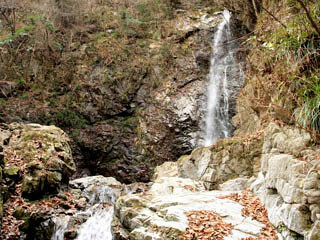 Hossawa Waterfall (佛沢の滝, hossawanotaki) is one of the major spot of Hinohara village. It has 4 steps 180ft. height and in the winter it will be completely frozen up. In the summer, it will be lighten up during the Water Waterfall festival. In the basin, people believed a giant serpent lives. Hossawa Waterfall is one of 100 best waterfalls in Japan. There are Restroom and couple of resturants. About 10 minits eazy hiking from the enterence to the waterfall. 3. take bus to Hossawa no taki 20 min.